Each year, the Veterinary Health Center’s three specialized hospitals care for about 17,000 hospitalized animals and thousands more on farms. 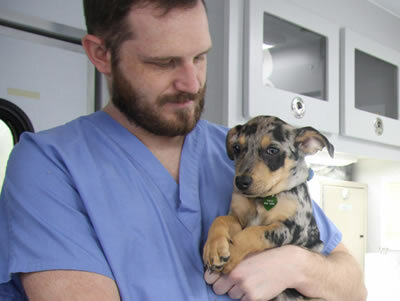 Many of these animals come from the Columbia area for primary and emergency care, while others are referred by veterinarians throughout the Midwest for our specialized services. Working alongside faculty and staff, veterinary students, interns and residents in postgraduate training participate in each phase of clinical care. The University of Missouri Veterinary Health Center is recruiting dogs with cancer for a new clinical trial that is being conducted in partnership with the National Cancer Institute. At present, MU is the only location in the country where the trial is under way. “While we can screen dogs with almost any kind of cancer to determine if they qualify for the trial, we are particularly interested in dogs with lymphoma or multiple myeloma,” said VHC Assistant Professor of Veterinary Oncology Brian Flesner, DVM, MS, DACVIM (Oncology). Dogs with mast cell tumors or hemangiosarcoma cannot be enrolled in the trial…. Today’s world is fast-paced. We fuel ourselves with microwave meals at home and fast food on the go. We want high-speed internet, next-day delivery and eyeglasses in an hour. We expect fast weight loss from fad diets and immediate results from the latest training regimen. Yet, Aesop’s fable reminds us that the slow and steady tortoise wins the race. Sometimes, by a nose. Mr. Pibb, a 60-pound sulcata tortoise, had a nose that was not a winner. It was a problem. “Mr. Pibb’s owner called us initially,” says Meagan Brophy, DVM, a clinical instructor at MU’s Veterinary Health Center (VHC)….